Ooohh, this gurl’s ’bout to git it!!! Just joking. 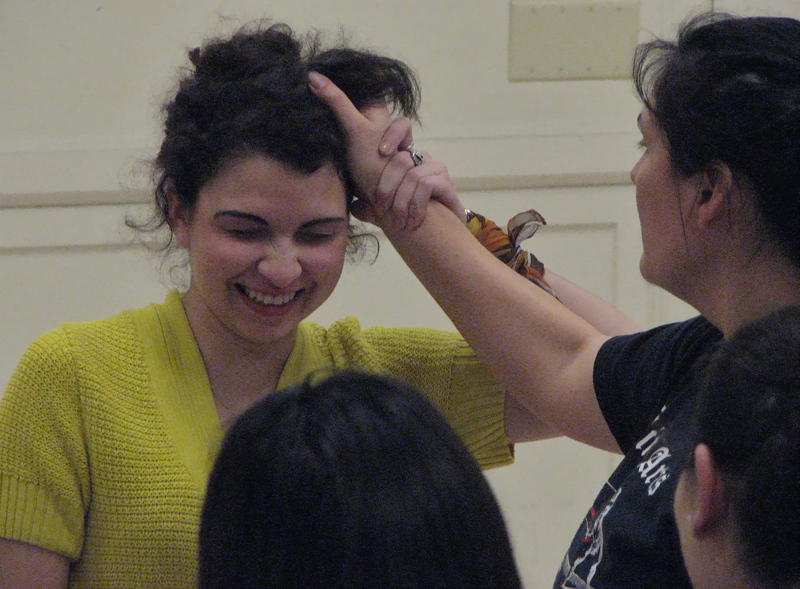 This is a picture of Carla our Fight Coordinator showing us how to pull hair. On Tuesday night, Carla Pantoja, certified stage combat instructor with Dueling Arts of San Francisco, one of 6 instructors in the Bay Area if memory serves, stopped by rehearsal to teach the cast some of the basics of stage combat, and to work with the roles that have to actually use it in the show. There’s people being shot and kids fighting, so she gave us a lesson in how to not hurt yourself. Which of course, is a good thing. No one ever wants to get socked in the junk! I should know, speaking from experience. Ouch! Or punched in the head! Again, experience. But there’s something in that reckless abandon that I love. Carla would slap my face if she heard me say that! Luckily, all those years of watching wrestling with my little brother paid off. The first thing that Carla showed us was how to fall. First there’s the Sit-Fall. For this you step back onto one foot and as you do, you lower your body like you are squatting backward. NOTE: Never place your hands behind you!!! You are only inviting injury to your wrists, hands, elbows or shoulders. Hold your hands out in front of you. (Don’t worry, the motion happens so fast no one really notices.) Once you are as low as you can get, shift so you can sit on the cheek that is on the same side as your extended leg. Next you roll your spine onto the floor with you head being the last thing to unroll. You have two options you can do with your hands and arms. Option one: spread them out like wings and let them fall with the palms facing the ground. Or option 2: After unrolling your head, swing your arms overhead making sure to keep your hands inline with your arms so that your wrist doesn’t slam into the ground and shatter into a buncha little pieces. She switched it up so we learned to fall to the side and to fall forward as well. Those take a lot more description and have a little different technique, so I think it would be best not to try and write that out. Maybe, she’ll give us a refresher course when we get closer to show time, and I will take footage of some of that. If she lets me. Next came a brief tutorial in punches. Thanks to my Tae-Bo type work out videos, I knew what the different punches were. Hey, hey!! What was getting me stuck was timing the slap to the punch for effect. There’s a little hit called a knap that an actor does to give the sound that the punch landed. The knap can be done by clapping one’s hands, slapping one’s chest or thigh, or anywhere else where the audience can’t see it happening. I thought we would move on to kicking and then contracting your body to simulate impacts, but that would have taken another day’s worth of work, and we had some fight scenes to get blocked. She did speak to us about gun use, because several people get shot in the show, so that was really informative. I wish I would have known that for West Side Story! Luckily, Tony never actually got accidentally injured. In hindsight, that’s a pretty scary thing to consider. We learned a heap load of stuff, like slapping someone in the back of the head, various pushes as well as what’s above, and in the video that follows. It was a great night! I did take footage, and I hope no one in the video is either offended or angry about me using it. It isn’t with the intent to make a mockery of rehearsals, but to show what a great group of people I am honored to be working with. To laugh it up now, because as we get further in the play, we start to work with things like murder and hate which can take a lot out of someone. Especially if they have to stay in that mentality for long periods of time. Again it’s with respect for these people that I share with all of you this zany crew. Posted on February 18, 2011 February 18, 2011 by theactorvistPosted in Blog PostTagged Carla Pantoja, Dueling Arts of San Francisco, injuries, Sit-fall, stage combat.